Governor Udom Emmanuel of Akwa Ibom State has Commissioned 100 hectares improved Cassava Stem Plantation at Okobo Local Government Area, with a call on the people to support his administration’s drive at ensuring food sufficiency in the state. The improved Cassava Stem Plantation which is a pilot scheme of Family Empowerment And Youth Re-orientation Path – Initiative ( FEYReP), Pet- Project of the wife of the Governor, Mrs Martha Udom Emmanuel, is geared towards making garri – a staple food and other allied cassava products available and affordable as well as create employment for the people of the state. Speaking at Ikono -Offi/Nsie community site of the plantation, Governor Emmanuel said “Apart from garri, cassava produces flour, ethanol and other products which attracts industries, agriculture is the quickest and highest employer of labour. All that is needed is the sufficient quantity to meet the requirement of the industries”. He regretted the situation where, issues like communal clash in neighbouring states where people go to buy garri would cause scarcity of the commodity in the state. He added that the project will guarantee stability in the price of garri and bring about food security in the state. The governor informed the people that, a cattle ranch has been established in Uruan Local Government Area to accommodate about 2000 herds of improved breed of cattle expected to arrive the state from Mexico. “So Akwa Ibom will soon join the league of states that consume fresh milk as against evaporated milk”. He added that high breed corn grains have been imported for free distribution to farmers in the state and particularly commended his wife Martha, the founder of FEYReP, for keying into the vision of ensuring food sufficiency in the state, pledging his administration’s support to the project. “I learned that (FEYReP) is going to plant corn as well, recently I have imported thousands of tons of rich corn seeds and we are distributing it free to the farmers”. The Governor directed the Inter-ministerial Direct Labour Committee and the Ministry of Works to rehabilitate two of the community schools as well as open access road to the plantation. Earlier the Wife of the Governor, Mrs Martha Udom Emmanuel stated that the project was in line with the governor’s initiative of returning people to the farm for employment generation and enhancement of food sufficiency in the state. Mrs Emmanuel said that the plantation has provided employment to 100 people of the area and expressed appreciation to the elders and youths of Ikono -Offi/Nsie community for providing land for the project, noting that the project is a springboard for other development programmes in the area. 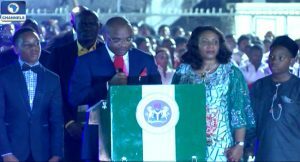 The State Coordinator of FEYReP Mrs Ime Inyang, said that Mrs Martha Udom Emmanuel has touched many lives through the programme with the latest being a move to feed the generality of Akwa Ibom people, besides generating employment through agriculture. Mrs Inyang said that FEYReP has acquired similar hectares of land for cultivation in other Local Government Areas.